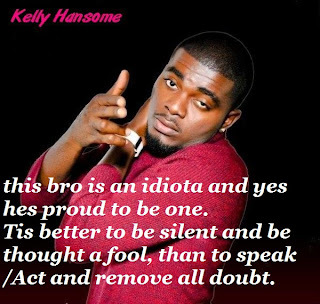 News from Nigeriafilms.com about Kelechukwu Ogbonna Orji popularly known as Kelly Hansome seems very disturbing. The reason is not far-fetched as the controversial artiste has reportedly descended on a journalist over a rumored story that he begged for a movie role. The story, which was allegedly peddled last year May 2011 had it that Kelly Hansome was seen begging a movie producer for a role in his movie. The artiste posted a picture of the arrested journalist online, where he was made to go naked holding a paper publication (as seen in the picture above). Kelly Hansome then vowed to deal with other publications that reported the said story. At about 9:36pm yesterday, Kelly was still ranting on dealing with media organisations that reported the story. He tweeted, "by the time I'm done with this guy, NO journalist will put up any news without confirming it first. I will list the [web]sites soon for everyone to know." This move, a way to go?